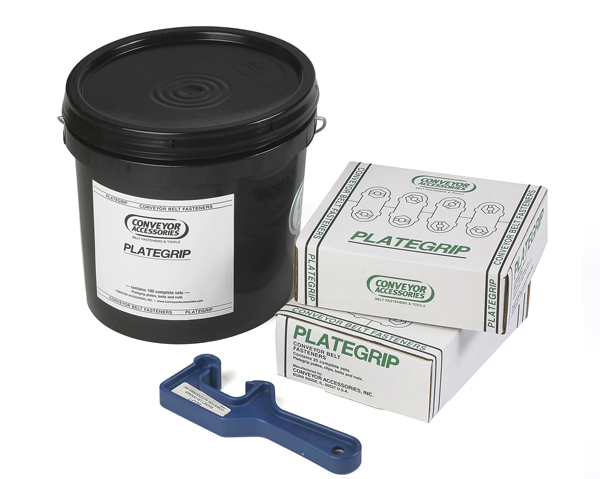 The traditional Plategrip teeth overlap the edges of the plates and provide extra holding power on thin belts. Passing smoothly over conveyor pulleys, Plategrip fasteners allow natural troughing of belts and smooth operation on both sides, through trippers and scrapers, as well as over crowned or takeup pulleys. 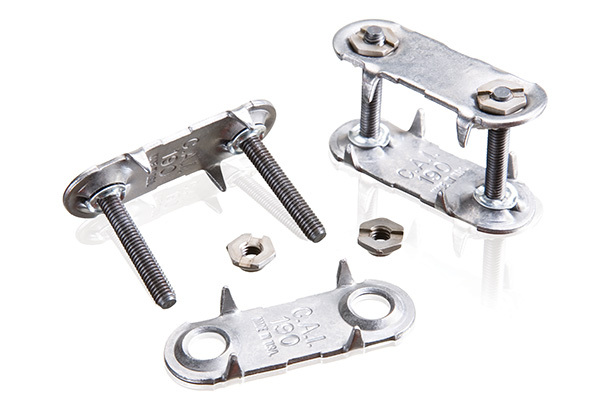 All buckets of solid plate fasteners have pre-assembled bolts and bottom plates that utilize our patented system, which includes the use of a special thin metal washer to clinch the bolt to the bottom plate during installation of the belt fasteners. This has proven to be superior to the use of plastic or nylon washers, which can slide along the bolt threads. The two keys to selecting proper size are belt thickness and pulley diameter. This chart indicates the Plategrip belt fastener size number for various combinations of belt thickness and pulley diameter. A 90° splice is generally used where pulley diameter and belt thickness correspond to recommendations in the chart to the left. The 45° splice should be used where pulley diameters are smaller than the recommended minimum diameter. The 45° splice will reduce flexing of belts behind the fastener and has the same strength as the corresponding 90° splice. Steel is the most common and economical belt fastener material, and is the standard for most applications. Steel fasteners are manufactured in a broad variety of sizes and shapes, and are suitable for use in new equipment or as replacement fasteners. Durgard is a special heat-treated steel with abrasion-resistant characteristics that provide several times the life of standard steel. Durgard Plategrip fasteners are not recommended for use in highly corrosive environments, but are instead specially formulated for abrasive situations. Stainless steel fasteners are best for applications where erosion is a major problem. Stainless steel is more resistant to abrasions, acids, chemicals, and magnetic attraction than standard steel. 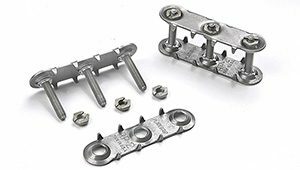 Plategrip fasteners are available in complete stainless steel sets, or with the top plate made of stainless steel and the balance standard steel. Repair Plates are used to prolong life of belts that have been torn, require patching of worn spots, or have “soft spots.” Repair plates should be used only across the belt, and never applied so they travel lengthwise over the pulley. Es are shipped in easy-to-handle boxes of 25 sets, bottom plates assembled with sufficient top plates, nuts, template nails, and instructions. Multiple boxes are shipped in over-cartons containing four or eight boxes. Cs are shipped in watertight buckets of 100 assembled bottom plates with sufficient top plates, nuts, template nails, and instructions. Ls are shipped in watertight buckets of 50 assembled bottom plates with sufficient top plates, nuts, template nails, and instructions.